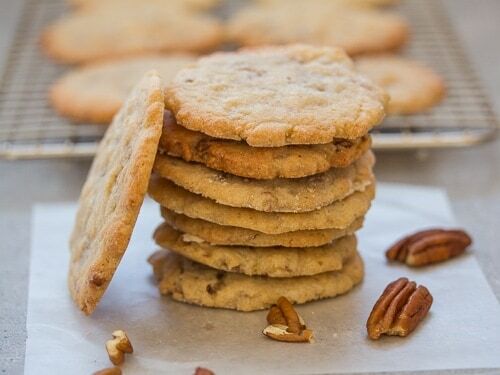 Crunchy Pecan Cookies, a brown sugar, butter cookie full of chopped pecans. Flattened and baked until golden and crispy. You won’t be able to stop at one! So here we are just in time for the weekend again, and I ask myself where does the time go? I have no idea! But it sure is the perfect time for cookies! The other day I was defrosting my freezer, yeah I have an oldie but a goldie fridge. It’s actually quite cute. An old time Italian fridge that stands about 5 feet tall and holds pretty much nothing. The best thing it does is it gets filled with ice. I seem to be continually defrosting it. But I have to say sometimes I find a few good surprises. And yes I came across a half bag of pecans that I picked up at Costco in Toronto in that freezer. There are a lot things I could make with pecans, I could make a pie, a cake , hmmm we’ll see. But I really thought My Mom’s Pecan Cookie Recipe would be perfect. And I was right, a thin crunchy so good cookie was the perfect idea. 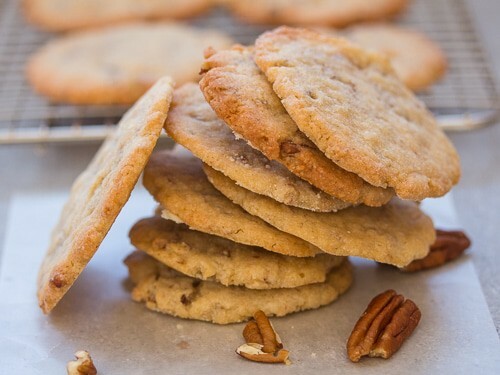 Then sit back and enjoy your Crunchy Pecan Cookies, you can share if you want. Enjoy! 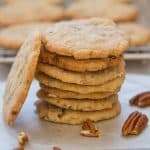 Crunchy Pecan Cookies, a brown sugar, butter cookie full of chopped pecans. Flattened and baked until golden and crispy. You won't be able to stop at one! Pre-heat oven to 350°, line 2 large cookie sheets with parchment paper. In a large bowl cream together butter, sugar and egg until light and fluffy, approximately 5 minutes, beat in vanilla. Sift the flour into the creamed mixture and combine with a spatula or wooden spoon. Gently stir in chopped pecans. 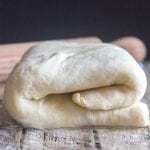 Shape dough into a ball, wrap in plastic wrap and chill for at least one hour or even over night. Remove dough from fridge and roll into 1 inch balls and place about 3 inches apart on prepared cookie sheets, with a flat bottomed glass, lightly floured, flatten the dough balls until they are quite thin. Bake for approximately 12-14 minutes or until lightly golden. Let cool before serving. 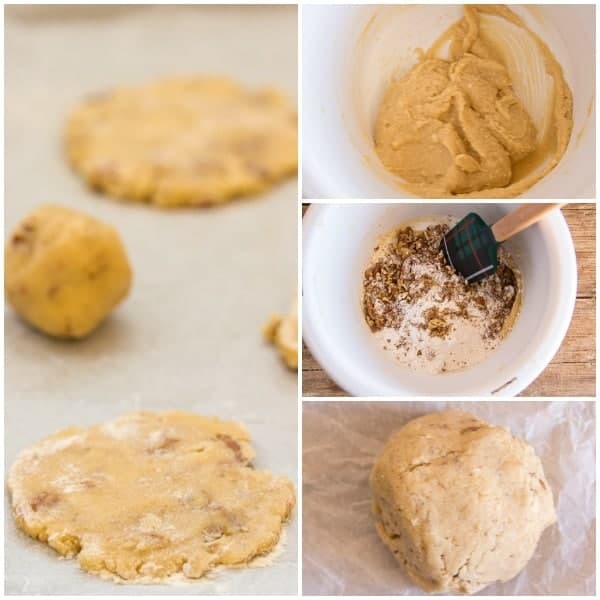 Have you tried using a square of parchment or wax paper under your glass when flattening the dough balls? I usually use parchment, the dough doesn’t stick, and the glass stays clean! Hi Diane, great idea thanks. I made these a couple of weeks ago and they’re so good I’m aboit to make them again. I didn’t have enough pecans last time so I did 50/50 pecans and almonds. They’re so crunchy and delicious. Hi Carissa, thanks so much, these are one of my husband’s favourites. So glad you enjoyed them. Have a wonderful Sunday. This recipe looks amazing, can’t wait to try it. 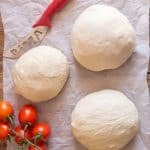 Have you ever made the dough into a log, then refrigerate or freee, then perhaps slice rather than using a glass to press? Just wondering if that would work too. 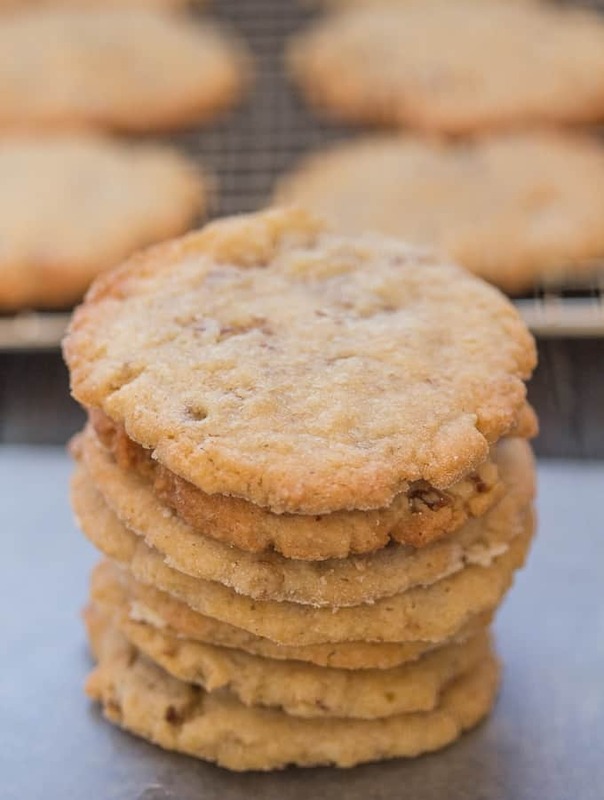 I love crispy cookies, thanks for sharing the recipe. Hi Michelle, I’m sure that would work too, but I don’t know how thin and crispy they would be. But if you try it that way let me know. 🙂 I have never frozen it but I am sure it would freeze ok. I accidentally froze them instead of putting it in the fridge but it works just as fine! Hi Joyce, these cookies can be frozen too so it worked out fine. Glade you enjoyed them. I prefer crunchy cookies to soft and your cookies look just like the type I would not be able to resist. We do a lot of Costco shopping and we usually purchase our nuts there. I bet those cookies didn’t last very long. Keeper of a recipe! I also prefer crunchy cookies and these are the best. My second time making them; I tried freezing them for 20 minutes before pressing them and it works. 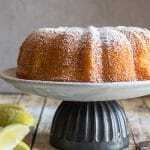 Again, thank you for sharing this recipe and I have shared it with my family and friends. Everyone loves the cookies. Thanks so much, so glad you enjoyed the cookies! Oh my goodness! 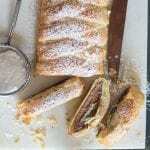 I am making these today! Hi Holly and Lane, thanks so much, I hope you enjoy them! These look amazing! Pecan is one of my favorite flavors!